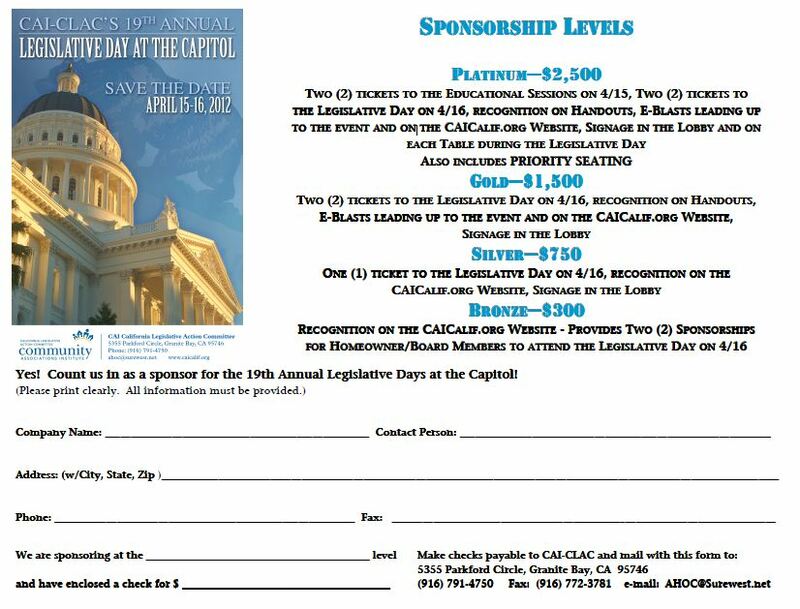 Get involved as a sponsor of the 2012 Legislative Day at the Capitol! 2012 is our 19th Annual Legislative Day at the Capitol. Each year, our members come together from throughout California, meet, discuss important issues, and then walk across the street to the State Capitol to meet with their legislators. This is your opportunity to be part of the most important event of the year for CAI-CLAC members. Below is a PDF, with information on how to participate as a sponsor. Join us and help us bring together a winning event on April 15 and 16, 2012 in Sacramento! Hello CAI-CLAC Bloggers! Here’s to the New Year! 760 bills were signed into law by the Governor and became effective yesterday, January 1, 2012. This single fact illustrates the importance of closely monitoring more than 4,000 bills each year to make sure that they do not harm Community Associations and their property value, as well as members’ life style and self-governing structure. Be sure to sign up for our Legislative Day in the Capitol to learn about new pending legislation and to meet YOUR senator and assembly member to lobby them on certain bills. I’ll be there to help you get ahead of the law making game and to brief you on the most important bills. More than 2,000 bills will be introduced by the end of February so we’ll have lots to talk about! See you in April ! !